Scott is a native of Wilmington and has been involved with Wilmington Drama League, The Brandywiners and OperaDelaware. Currently, he is a member of of City Theater Company's Board of Directors. He is also an interior designer, visual artist and Realtor. Tiffany Dawn Christopher as Felicia Farrell. Photo courtesy of Kristin Romero Photography. Memphis the Musical was another outstanding production from The Wilmington Drama League, showcasing the organization's huge step forward in professionalism. This is a poignant story about the birth of Rock ‘n’ Roll and the breaking of racial barriers to bring a new form of music to the masses. The theme, though historical, also seemed to touch today's issues of race and intolerance, and marriage equality. Today, few give a second thought to interracial couples; in the time period of this show (the 1950s) however, Huey Calhoun and Felicia Farrell were almost killed because of their love. The people who were moved by the music just saw love; but in the end, society's prejudices kept this couple apart. This show proves that music (much like love) is a universal force that knows no boundaries and can connect people by the movement of their souls. The wonderful messages that resonate in this story are breaking barriers and pursuing dreams no matter the odds. 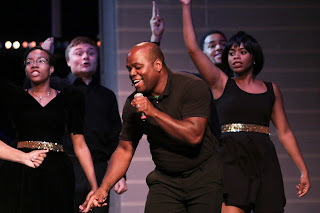 This show was thoughtfully directed by Dominic Santos, who brought the audience to laughter, tears and joyful exuberance through music. I challenge you not to dance in your seat. The soulful voice of Anthony Vitalo as Huey Calhoun created the breakdown of vocal stereotypes needed to connect these two groups of people. However, this show belongs to Tiffany Dawn Christopher as Felicia Farrell. She lit up and owned the stage just like the rising star she portrayed. Memphis was beautifully supported with the great talents of Daniel Urdaneta, Darryl Thompson, Kathy Buterbaugh -- and an attention-grabbing, standout performance by Tommy Fisher-Klein as Gator. This talented ensemble of singers, dancers, musicians, costumers, set designers and crew helped to make this a truly memorable show. My only disappointment was that the sound system experienced issues that were annoying and interfered with the show. It was truly a shame to have such glaring technical problems affect the performances of these talented actors and singers. As a Wilmingtonian who performed on that stage many years ago, I am proud of this production and all who were involved. 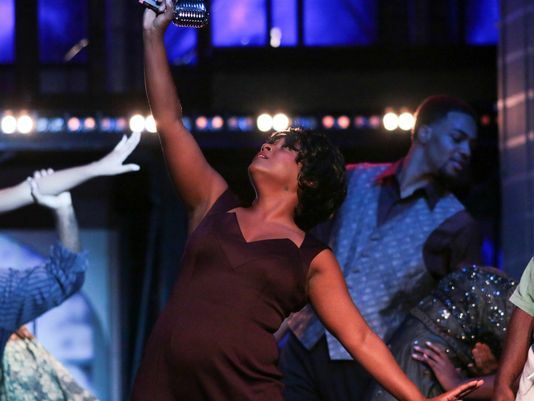 Memphis the Musical is a must-see for many reasons -- it was certainly “Music of My Soul." The show runs for one more weekend, through September 27.